Irritability is a leading symptom in female-specific mood disorders occurring from menarche to menopause, and it can be serious enough to interrupt women's lives as well as warrant treatment. This guide will help women understand irritability better as well as give them tips on how to identify the root cause of the problem. It will also address tips for how to manage the symptom for heightened irritability treatment success. Irritability is a common symptom of premenstrual syndrome (PMS) and a core symptom of premenstrual dysphoric disorder (PMDD). 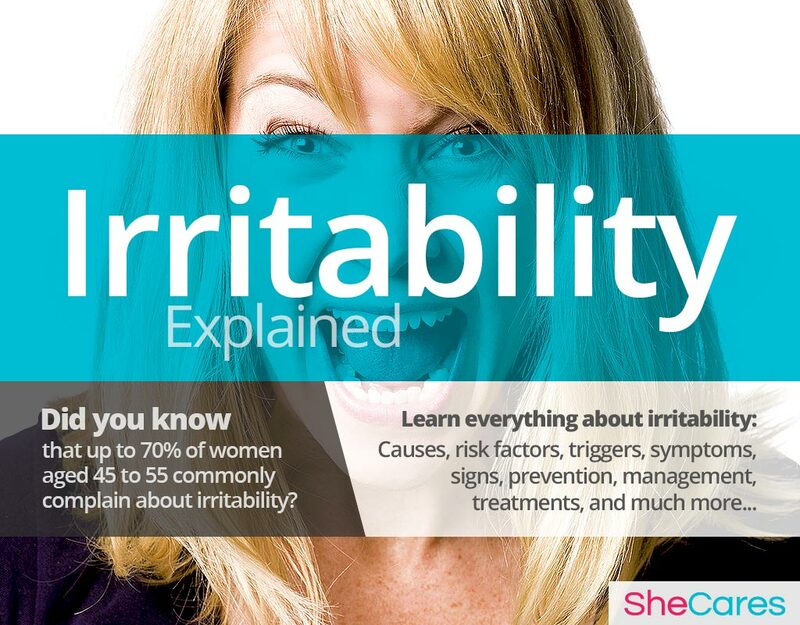 Irritability is the main mood complaint for up to 70% of perimenopausal women. Perinatal mood disorder studies have shown that there is some deterioration in psychological status across the second and third trimesters of pregnancy. Feeling irritated is defined as having or showing a tendency to be angered, annoyed, or impatient. It is characterized by a state of physical or psychological tension that easily and quickly escalates. Most of the time, the cause of a woman's irritability is attributed to external factors. However, one of the most likely causes of irritability for women is hormonal imbalance. Hormonal fluctuations take place naturally during a woman's menstrual cycle and also during certain stages of reproductive life, such as puberty, pregnancy, post-partum, perimenopause, and postmenopause. These hormonal changes can affect emotional stability as well as physical functioning, leading to symptoms like irritability. It is difficult to accurately establish different types of irritability because each woman's individual experience can be drastically different from the next. However, there are three criteria that can help identify ways in which this symptom may vary: frequency, duration, and intensity. In some case, irritability can be a symptom of early menopause. This condition has been known to exist in women as young as 20, and usually affects around 1 in every 100 women. It is caused by a premature change in the activity of ovaries, causing lower amounts of hormones to be produced. Learning about the causes of irritability provides the key to understanding how to prevent and treat this symptom. While the exact causes of irritability are complex and difficult to pinpoint, most doctors and researchers believe hormonal changes are the primary cause of irritability in women. Because changes in hormones lead to health disorders, researchers have linked fluctuating levels of hormones, especially estrogen, to women's susceptibility to irritability and depression. Estrogen and progesterone influence the production of serotonin, a “feel-good” neurotransmitter well-known for its mood enhancing qualities, influencing appetite, sleep, sexual desire, and memory. A deficiency in estrogen at certain points in the menstrual cycle and during phases of significant hormonal imbalance causes levels of serotonin to decrease and, consequently, results in irritability. 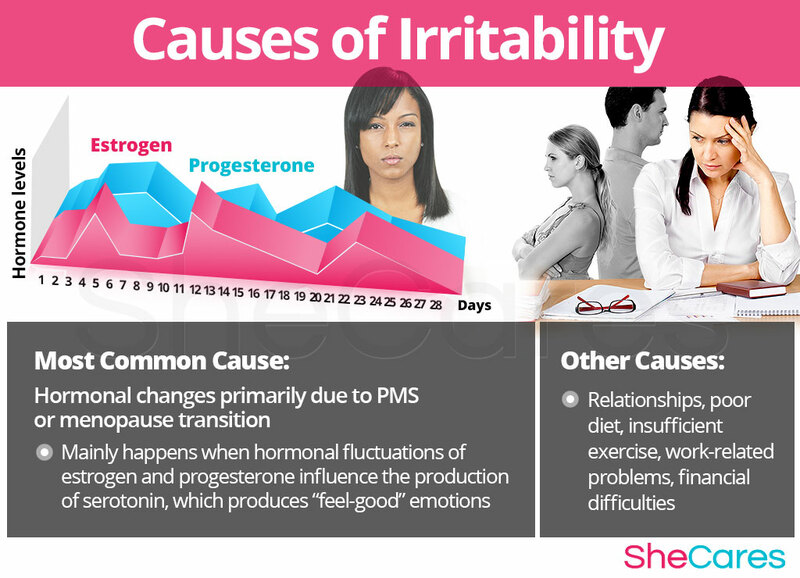 In this sense, we can say that irritability is largely caused by hormonal fluctuations during the changes women go through during their reproductive lives. There are several stages within a woman's reproductive life in which it will be more likely for her to be irritable, including puberty, PMS, pregnancy, post-partum, breastfeeding, perimenopause, and postmenopause. 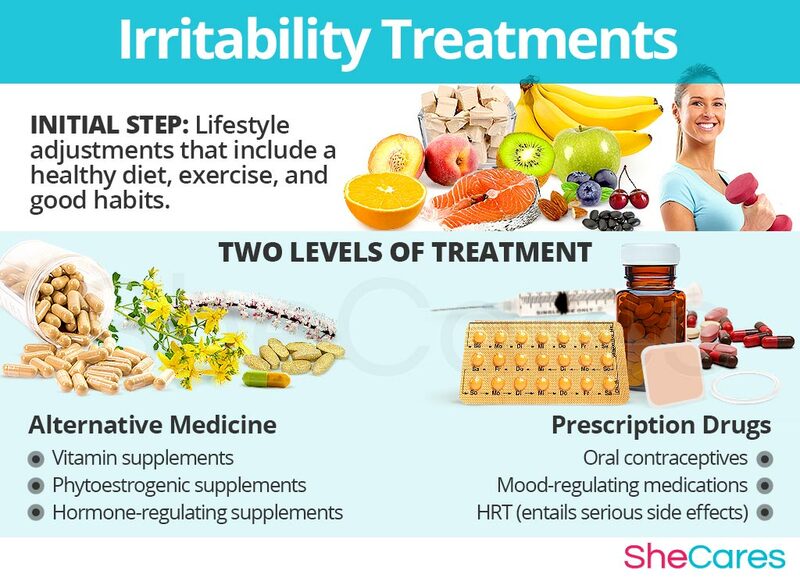 While hormonal imbalance is the major underlying cause of irritability during a woman's life, experts also point out that irritability may be caused by other, underlying conditions or situations, including relationships, poor diet, financial difficulties, and work-related factors. Indications of depression in teenagers are often different from those of adults. They often display signs of irritation rather than despondency. It is also possible that more physical pain presents itself, such as muscle tension, stomachaches, and headaches. In some cases, a woman's circumstances combined with depression can cause irritability. Some women are more likely than others to suffer from irritability because of inherent psychological, behavioral, and health reasons, such as obesity and stress. These predisposing factors can affect a woman's hormone levels and increase the chances of her experiencing undesirable emotions during her reproductive life. 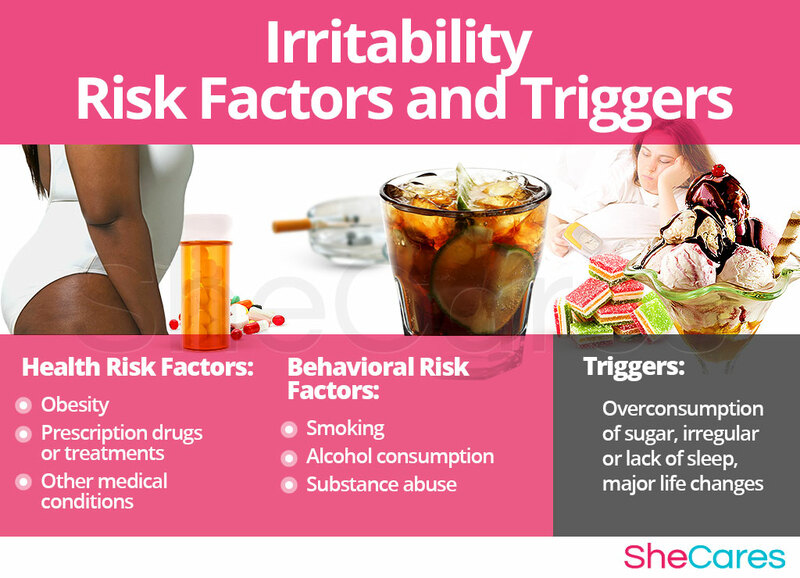 In addition to long-term risk factors, irritability can also be triggered by certain environmental factors and behavioral habits. Avoiding these unhealthy environments or habits as much as possible may help to avoid the onset irritability. These include habits like overconsumption of sugar and lack of sleep. Because each woman has her own individual way of managing emotions, stress, and of coping with difficult situations, each one will experience the symptoms of irritability differently. However, many irritability symptoms are common among women undergoing hormonal imbalance. What other symptoms might occur with irritability? In addition to these general symptoms, irritability may be accompanied by other symptoms that vary depending on the underlying cause or the specific stage in which the woman is going through. These symptoms may be psychological (cognitive) or physical. As opposed to more noticeable symptoms, medical signs are measurable criteria that are usually assessed by a physician. The following medical signs will most likely be taken into account by a physician when diagnosing a woman. To diagnose and identify irritability symptoms, a doctor will typically perform four procedures. First, he or she should review the patient's medical history, then conduct a physical exam, and finally do a psychological evaluation. The doctor may order additional tests if necessary. 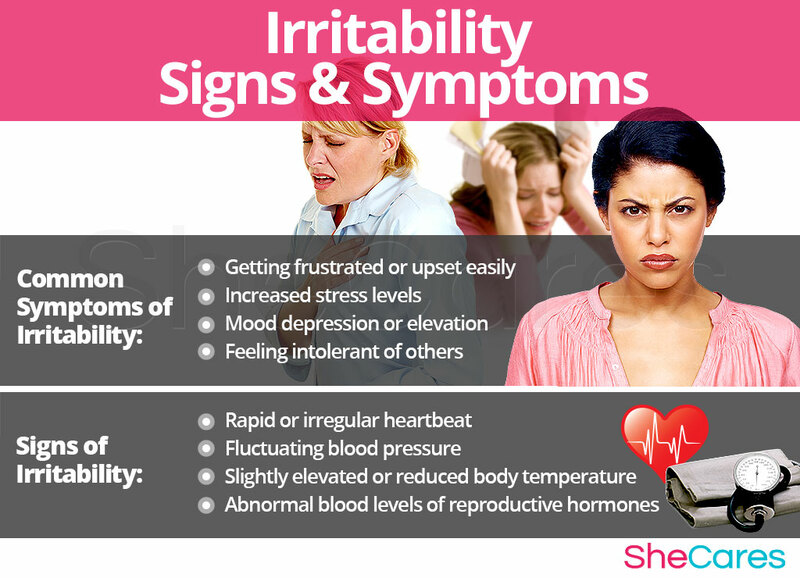 In rare cases, when the cause of irritability is left untreated, the symptoms can lead to certain complications, which can be more risky for a woman's emotional and physical health. However, it is important to remember that in the majority of cases, irritability will not require serious medical interventional. These possible, but uncommon, complications of untreated irritability can include depression, anxiety, stress, and sleep disorders. Women experiencing irritability may wish to treat or learn how to prevent future episodes. Luckily, there are healthful tips and habits that will lessen a woman's chance of being irritable or allow her to learn how to manage her irritability. Feeling unreasonably impatient, angry, or irritable - or experiencing these emotions persistently - can sometimes be in indication of a more serious condition, such as depression. If the coping mechanisms highlighted in this article are ineffective, it is advised that you discuss your symptoms with your doctor. While there is no single way to completely prevent irritability, there are a few steps that a woman can take to lessen her chances of developing severe irritability or to minimize the frequency of irritable episodes. Lifestyle changes for prevention are extremely important, especially in regards to diet, exercise, and healthy habits. Moreover, women may seek ways to complement these lifestyle approaches with the use of supplements that help enhance the endocrine system and, therefore, help prevent or ease symptoms of hormonal imbalance, such as irritability. Wherever a woman happens to be when feeling irritated, there are effective ways to manage irritability. Making minor daily changes and avoiding triggers can make a huge difference for women who are trying to manage irritability. There are certain tips and tricks available that can help improve handling irritability, giving women the tools they need to cope. The following are general tips that women of all ages can use, such as partaking in breathing techniques, engaging in other activities, and avoiding triggers. Furthermore, there are also specific management tips that can be followed by women during puberty, pregnancy, post-partum (including breastfeeding), perimenopause, and postmenopause. Specific tips for managing irritability during puberty include identifying what is happening, getting enough sleep, and being creative. Specific tips for managing irritability during pregnancy include sharing feelings and trying pregnancy yoga or meditation. Specific tips for managing irritability during post-partum (including breastfeeding) are setting aside “quality time”, easing back into exercise, and taking it easy, among others. Specific tips for managing irritability during perimenopause and postmenopause include joining a support group or enjoying a weekend getaway. Alternative treatments are also a great way to manage irritability by reducing stress and improving emotional and physical health. Alternative treatments include massage, acupuncture, and biofeedback. While these measures often help prevent the initial emotional outburst and help women learn how to manage irritability overall, they are unable to treat the root cause. There are several natural irritability treatments that can help treat the hormonal causes of the problem. 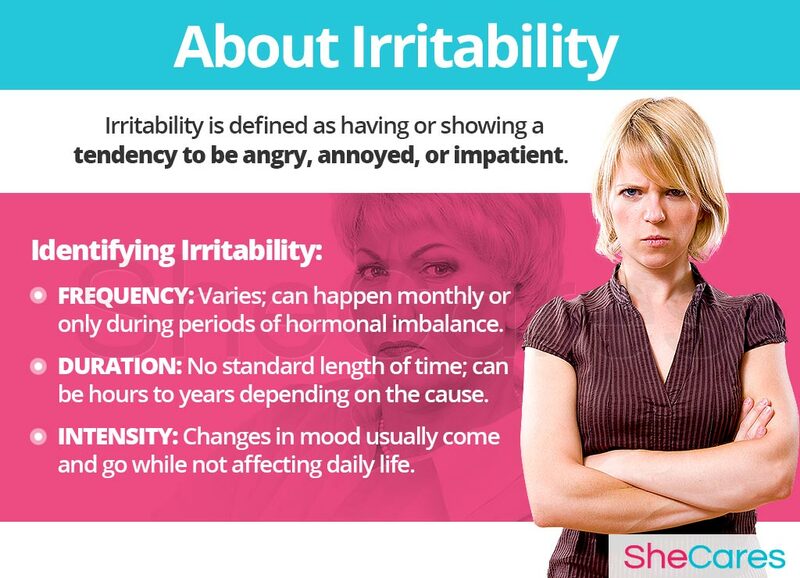 Irritability can be frustrating for any woman who experiences it. However, some cases are so severe that they begin to interfere with daily life. Fortunately, it is possible to find an effective treatment. Three levels of approaches can be considered for treating irritability depending on the underlying cause. These are categorized as: (1) Lifestyle Changes, (2) Alternative Medicine, and (3) Pharmaceutical Options. This primary level of irritability treatment involves the least amount of risk; although, it conversely requires the highest amount of self-discipline. Often, simple changes in lifestyle can reap huge benefits in achieving a higher overall level of health. Fundamentally, start with an improved diet, regular exercise, and healthy habits. Although these changes will help promote over well-being, they are often not the most direct way to balance hormones, one of the leading causes of irritability. Further treatment may be necessary. Alternative medicine has proven to be an excellent way of preventing irritability related to hormonal imbalance in a safe and natural way. Alternative medicines and supplements generally involve little to no risk and can be an extremely effective for preventing and treating irritability in its entirety, depending on the initial cause. In the case of herbal supplements, there are two main types to take into consideration: phytoestrogenic and hormone-regulating herbal supplements. These supplements, such as St. John's Wort, contain estrogenic components produced by plants that complement the low estrogen hormones in a woman's body, helping alleviate irritability. By introducing plant-based estrogens into the body, these herbs treat the underlying estrogen deficiency behind irritability. These supplements, including Macafem stimulate the body's natural hormone production by nourishing the pituitary and endocrine glands, helping the hormonal system produce hormones more efficiently. This results in the balance of estrogen as well as other important hormones such as progesterone. These supplements can be considered the safest and most natural way to treat the underlying hormonal imbalance behind irritability and can be taken throughout a woman's life as they support the body's natural hormone production. Additionally, there are other types of supplements that promote a healthy hormonal balance, including herbal supplements. A combination of approaches is usually the most effective route to take. Lifestyle changes combined with alternative medicine can ultimately help a woman overcome irritability caused by hormonal imbalances. However, for some women, irritability and other symptoms will be so severe that a more drastic treatment is necessary. Interventions at the third level involve the highest risk and often the highest costs. Not all treatments are suitable for women at every life stage; therefore, it is strongly recommended to speak to a licensed healthcare practitioner before starting any pharmaceutical irritability treatment. There are two main types of pharmaceutical options that can be prescribed to treat irritability: hormone-regulating medication and mood-regulating medication. Overall, these three approaches are not mutually exclusive. A woman may use different approaches at different times or any combination of them, depending on her specific situation. 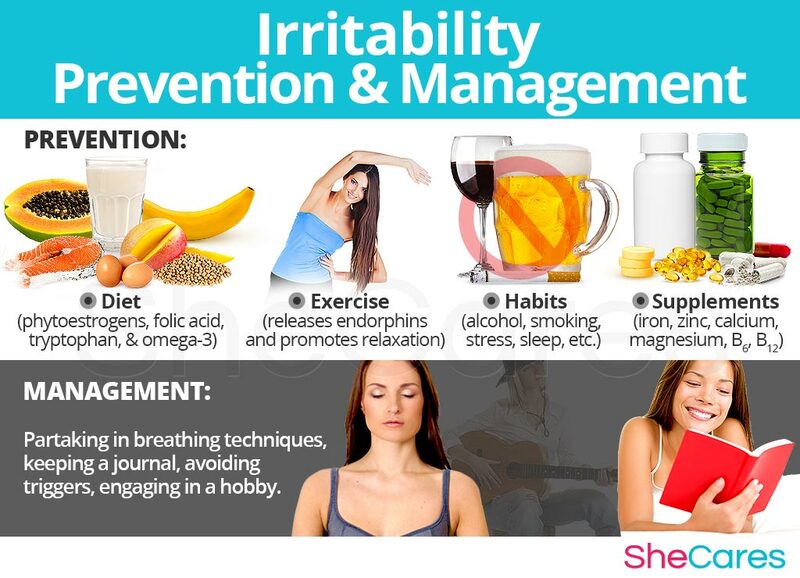 Recently, more and more women find that preventing and dealing with irritability can be accomplished via a combination of healthy lifestyle and alternative treatments.